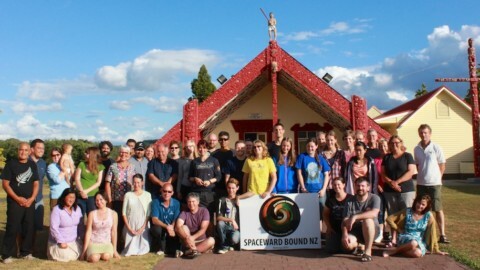 Home New Zealand’s hot springs contribute to discovery of oldest evidence for life on land! 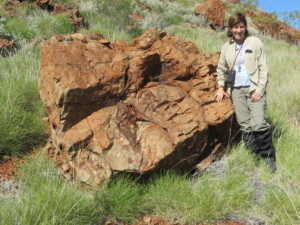 Professor Kathy Campbell in the Pilbara, Western Australia, with ~3.5 billion year old pillow basalts. Photo: T. Djokic. 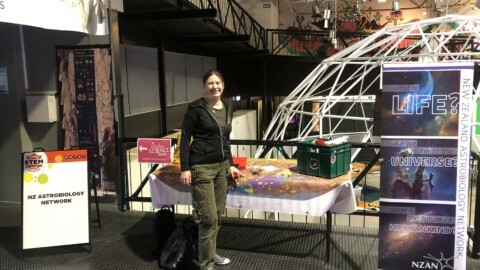 Professor Kathy Campbell from The University of Auckland is the co-author of a paper published in Nature Communications in May 2017 that pushes the evidence for the oldest life on land back to 3.48 billion years ago. Campbell and her team of collaborators from Australia, Argentina, the U.S. and France have just been awarded a 2017 Royal Society Te Apārangi Marsden Fund grant for the research project ‘Some Liked it Hot: Searching for Early Life in Terrestrial Hot Springs’ to drill fresh rock core in the Pilbara region of Western Australia to obtain high-resolution geochemical, mineralogical and textural data to tease out how and where earliest terrestrial life lived. 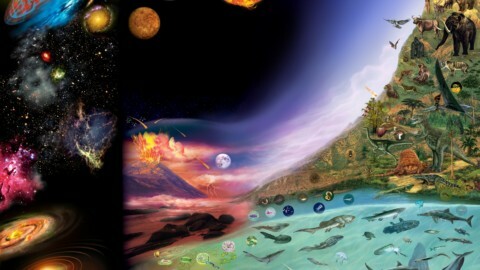 Scientists believe life began sometime around 4 billion years ago, perhaps in deep sea hydrothermal vents or alternatively on land, in a version of Charles Darwin’s “warm little pond”. The deep sea hypothesis has been popular for 30 years but some believe life could have taken hold in terrestrial hot springs on an emergent land surface. 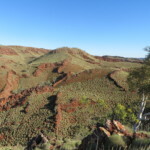 One of these “go-to” places where scientists make pilgrimages to marvel at early life is in a well preserved and very ancient piece of Earth’s crust, the Pilbara craton of Western Australia. 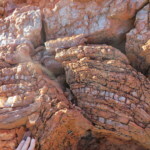 Stromatolites – layered masses of microbes and sediments – are relatively commonplace, preserved in stone of the Dresser Formation (3.48 billion years old). And while it has been known for a long time that the Dresser contains examples of very early life, it was originally believed that these were marine-based life forms. 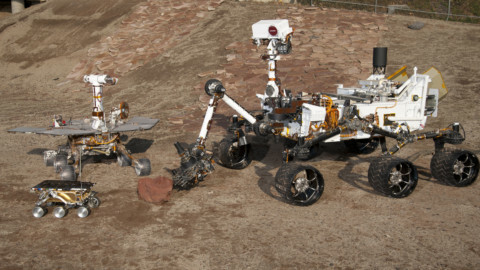 However, this team of University of New South Wales and University of Auckland geoscientists looked beyond the obvious and poured over Dresser rocks to take a closer look. 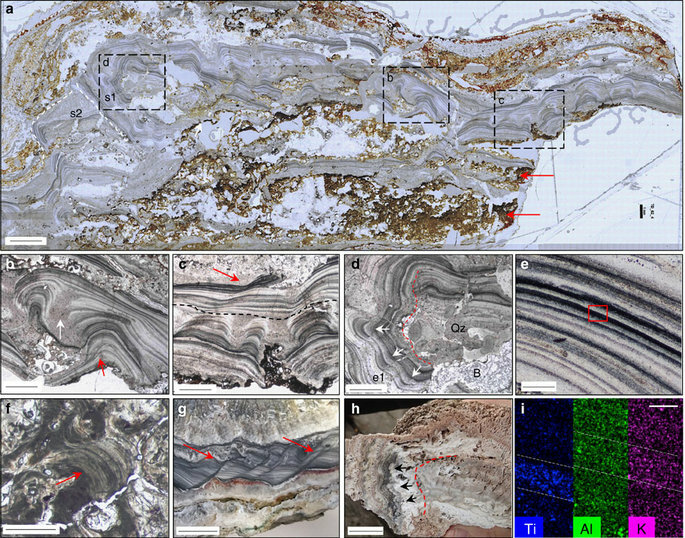 This new discovery is special because it brings together evidence that the stromatolites and other purported microbial and features in the Dresser Formation evolved on land, within a volcanic caldera (Van Kranendonk et al., 2008). The key evidence for the presence of a paleo-geothermal system at the Earth’s surface is the recognition of geyserite, a silica-rich, densely layered and knobby or finger-like rock that forms only in the hot vent areas (~75-100 degrees Celsius) of terrestrial hot springs (Campbell et al., 2015a). Geyserite was found together with already known and newly discovered biosignatures in the Nature Communications article, which took a new look at a very old place. The rocks are deemed to have formed in or near river and lake sediments that hosted the ancient geothermal system, pushing back the geological record of hot springs by 3 billion years and the record of life on land by up to 580 million years. 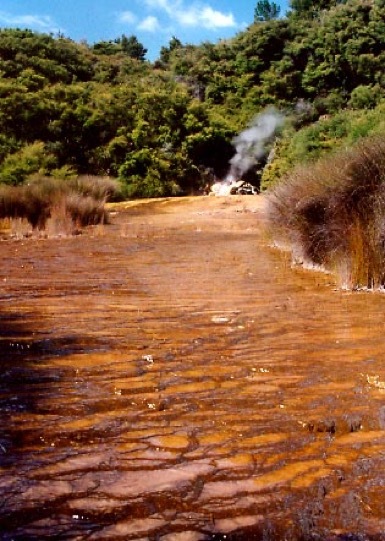 Now the new funding from the New Zealand Marsden Fund will allow drilling of these especially old hot springs to get at fresh samples about 70 m beneath the weathered, rusty red surface of the Australian Outback. Back in New Zealand, where the most ancient rocks are only a mere ~500 million years old, this discovery has very special meaning – the research team believes that the ancient environments now fossilised in Western Australia were very similar to what we see around hot springs in Rotorua today, and we need look no further than in our backyard, for example at Orakei Korako where colourful microbial mats thrive in active hot springs. Studying these places now, because they are presently depositing minerals upon and within living microbial mats and their sticky milieu (i.e., exopolymeric substances, or EPS – microbially secreted ‘slime’ to the layperson), can bring further understanding to the extreme conditions under which early life flourished. 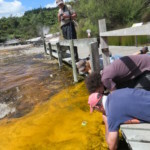 In February 2016, UNSW team members joined University of Auckland collaborators for a field trip to observe the formation mechanisms and role of microbes and mineralisation (in this case, silica discharging from the thermal waters) at varied active hot springs of the Rotorua area. 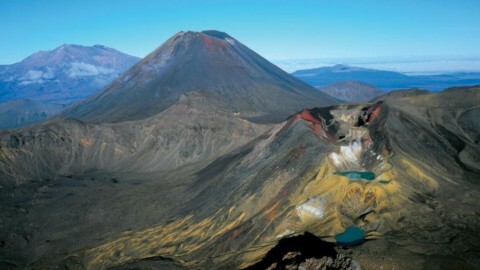 For example, at Orakei Korako (or Hidden Valley) they encountered a large sheet of cyanobacteria (yellow) in gooey EPS, growing happily under a summer sun in moderately warm (~50 degrees Celsius) thermal waters, trapping zillions of bubbles of oxygen formed from photosynthetic microbial processes. Because the mats are constantly bathed in silica-rich thermal fluids, bubbles and microbes can become entombed in the siliceous hot spring deposits (sinter) to create a solid rock record of once ancient and, like in the Pilbara, long-gone geothermal activity. Detail of oxygen bubbles trapped in cyanobacterial mats and their exuded EPS. Photo: T. Djokic. Similar bubbles are reported in the paper; see figure below (Djokic et al., 2017), and are currently under further detailed microscope and mineralogic study. This ‘petrified’ version, frozen in time, and lined and filled with various minerals from the Dresser Formation, is believed to be analogous to what can be observed forming in modern hot springs like at Orakei Korako. One of the holy grails of astrobiology is the study of extreme environment analogues for understanding early life on Earth and perhaps that on other worlds within the Solar System. When biosignatures in extreme environments turn to stone under rapid, early mineralisation, akin to what occurs along hot spring discharge channels, their long-term preservation pathways can be tracked into the geological record. In the Dresser Formation rocks, there are wavy, layered, aggrading horizons that appear very similar to terracette (mini-terrace) deposits forming on hot spring discharge aprons that are building up the solid sinter deposit. In modern hot springs, these distal, i.e. relatively cool (<40 degrees Celsius), terracettes are covered in dense, pillar-like horizons (or ‘palisades’) of microbial filaments (Calothrix cyanobacterium). As the silica deposits upon the terraced surface of the spring discharge channels and pools, the sinter terracettes grow upward and outward to form distinctive internal growth features replete with microbial palisade textures. 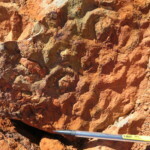 In the image below, the rock on the left shows palisade fabric from the Pilbara (the mini-terrace ‘lips’, or rims, are marked with large blue arrows) – Underneath the palisade fabric there is another kind of inferred microbial fabric of dark, bushy dendritic morphology. The rock (sinter) on the right from Te Kopia, New Zealand, illustrates upwardly and outwardly growing terracette rims, filled with vertical palisade fabric of silicified microbes – it is between 1800-3500 years old (Martin et al., 2000). Large blue arrows mark the upward and outward growth lips of terracette margins. In 1889, Weed was the first to recognise palisade textures in modern hot-spring environments at Yellowstone National Park (USA). He described them as ‘‘fibrous’’ layers of silica-encrusted ‘‘algous vegetation”, now known to be formed by cyanobacteria. In Devonian sinters (~400 million years) from the Drummond Basin, Australia, Walter et al. (1996, 1998) reported tubular microfossils with diameters of 5–8 microns and 10–12 microns, akin to thermal spring filament diameters characteristic of modern New Zealand examples. 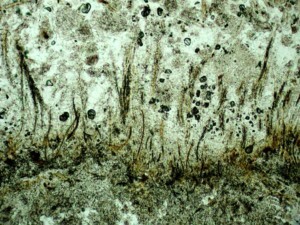 It is unknown what kind of microbes formed the palisade fabric in the Dresser Formation, but their morphologies are similar in character to much younger microbial sinters. Palisade fabric is common in other fossil hot-spring deposits such as the Devonian Windyfield chert, Scotland (Fayers and Trewin, 2003), Jurassic sinter in Patagonia (Guido and Campbell, 2009, 2011, 2014), and Quaternary sinters in the TVZ (New Zealand) at Umukuri (Campbell et al., 2001), Tahunaatara (Campbell et al., 2003), Mangatete (Drake et al., 2014), Te Kopia (Lynne and Campbell, 2003), and Orakei Korako (Lynne and Campbell, 2003, 2004). Their preservation into the “deep-time” geological record of hydrothermal settings was studied by Campbell et al. (2015b). An example of a modern sinter discharge apron is shown here from Healy’s Bore 2 spring at Tokaanu, Taupo Volcanic Zone (TVZ), New Zealand, with small mini-terraces (terracettes) building up a microbial palisade fabric (brown Calothrix cyanobacterium; Campbell et al., 2015b) in the distal reaches (<40 degrees Celsius) of the geothermal outflow. This colourful scene has been frozen in time inside the rocky outcrops of the Pilbara and at Te Kopia. Studying young extreme environment analogues helps us imagine steaming hot springs along creeks and near lake shorelines of early Earth that harboured early life in plausibly similar ways, oblivious to the fact that human beings would some 3+ billion years later marvel at their tremendously long history. How life appeared is as yet an unsolved mystery, but this discovery of significantly older siliceous hot spring rocks – sinter, including the near-vent form known as geyserite – suggests that life was flourishing in terrestrial (on land) early Earth environments by 3.5 billion years ago. 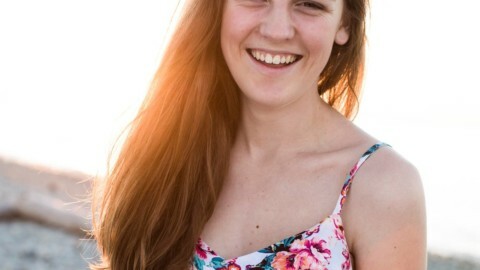 quotes from PhD student Ms Djokic (UNSW), the first author of the paper. Here is the abstract quoted from Nature.com, click here for the link to the full paper. 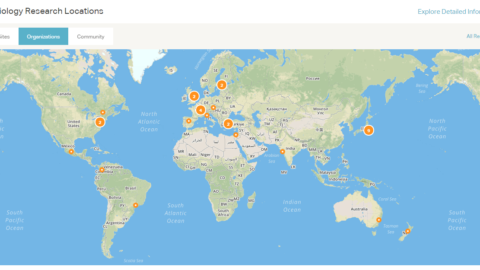 Altmetrics score for the article is: 1062. Campbell, K. A., Guido, D.M., Gautret, P., Foucher, F., Ramboz, C., Westall, F. Geyserite in hot-spring siliceous sinter: Window on Earth’s hottest terrestrial (paleo) environment and its extreme life. Earth-Science Reviews 148, 44-64 (2015a). Campbell, K. A., Lynne, B. Y., Handley, K. M., Jordan, S., Farmer, J. D., Guido, D. M., Foucher, F., Turner, S., and Perry, R.S., Tracing Biosignature Preservation of Geothermally Silicified Microbial Textures into the Geological Record Astrobiology 15 /10, 858-882 (2015b). Drake, B.D., Campbell, K. A., Rowland, J. V., Guido, D.M., Browne, P. R. L., Rae, A., Evolution of a dynamic paleo-hydrothermal system at Mangatete, Taupo Volcanic Zone, New Zealand. Journal of Volcanology and Geothermal Research, 282, 19–35 (2014). Martin R., Mildenhall D., Browne P.R.L., Rodge K.A, The age and significance of in-situ sinter at Te Kopia thermal area. 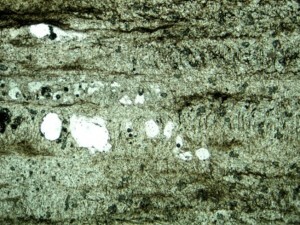 Geothermics, 29, 367-375 (2000b). Van Kranendonk, M. J., Philippot, P., Lepot, K., Bodorkos, S., Pirajno, F. Geological setting of Earth’s oldest fossils in the ca. 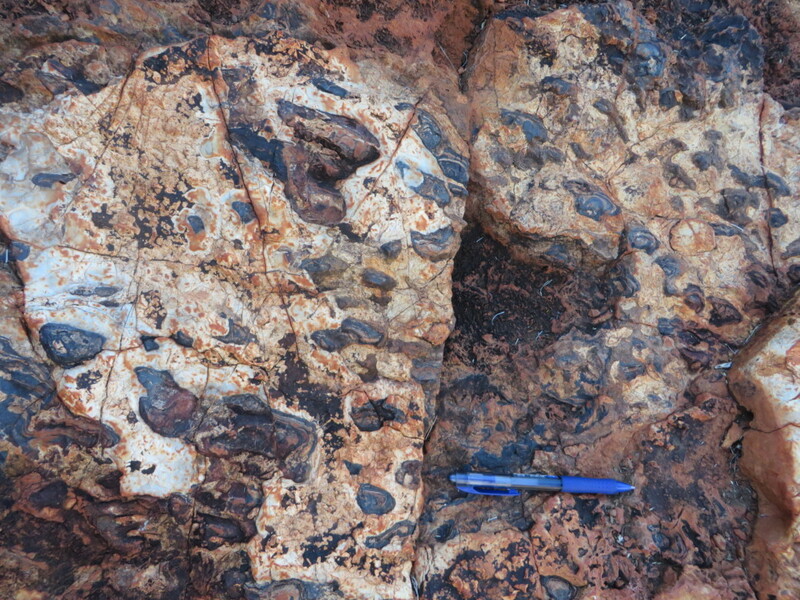 3.5 Ga Dresser Formation, Pilbara Craton, Western Australia. Precambrian Research 167, 93-124 (2008).